As a very recent newcomer to the Internet it was a pleasant surprise to find your site. 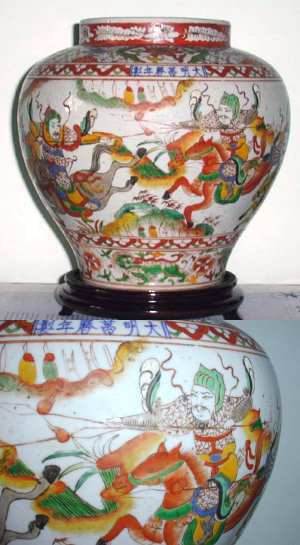 I have attached two photos of a piece of pottery we purchased in Shanghai recently. The dealer tried to convince us it was genuine, but for the price we paid we would need to be very fortunate for it to be so. However we bought it because it appealed to us and are quite satisfied. The dealer claimed it to be Ming and apparently the writing says some thing about the Ming Dynasty. The bottom (underside) is serrated and there is no chop.The colour where the glaze ends around the bottom is reddish brown. Could you tell us something of the design and the period - and if by perchance it is authentic. Unfortunately there is not much I can add since you are pretty much on the right track already. I can only confirm that the Jar is nice but as you suspected, not antique. The "style" is Ming, though. The decoration is a war scene, possibly based on a theater play or book illustration - and unfortunately beyond me to identify.